Melanie Gall in Piaf and Brel: The Impossible Concert. Photo courtesy Edinburgh Fringe Festival. BOTTOM LINE: An enthusiastic cabaret show featuring one talented woman’s interpretation of beloved chansons from French superstars Edith Piaf and Jacques Brel. Standing behind a single microphone, Melanie Gall certainly looks the part of a French chanteuse. In her homage to the iconic French superstars Edith Piaf and Jacques Brel, both known for their tragic lives and lasting musical impact, Gall sings songs of romance, heartbreak, and hope. Despite their overlapping time in Paris, Piaf and Brel never actually met in life, which, Gall explains, explains the impossibility of the concert. 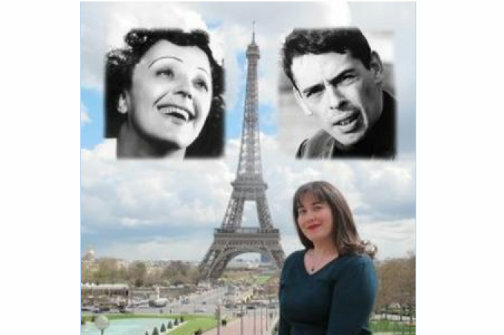 With a shared nostalgic romanticism and sense of longing, Piaf and Brel’s songs pair beautifully together and speak to a particular period of French post-war history in which money was tight and morale waned, yet culture remained resilient. Sung almost entirely in French—a blessing, as most of the English translations of their work lack a certain je ne sais quoi—the music of The Impossible Concert includes such classics as Brel’s bawdy “Amsterdam” and Piaf’s lilting “La Vie en Rose,” as well as some lesser known pieces. Smartly, Gall does not explain the meaning behind every song but instead provides biographical stories, lore, and personal anecdotes between the alternating numbers in order to contextualize the pieces. She then largely relies on the tone and audience to translate the music. Despite the bittersweet quality of most of The Impossible Concert’s songs—as well as the historical sadness in the lives of Brel, a frustrated cardboard box maker from Brussels, and Piaf, born among the Parisian brothels—Gall employs a Panglossian perspective and persists with bright and cheerful enthusiasm. Her vocal tone matches her mood with bright colors and a broad range. She makes it clear that the performance is not intended to be an impersonation of Brel or Piaf, whose gritty voices are nothing like Gall’s operatic shine. There are moments where this is a bit underwhelming, particularly during Brel’s beautiful and broken “Ne Me Quitte Pas,” which needs a voice with more raggedness. Even so, Gall is undeniably charming and relentlessly passionate, which redeems the performance. In a brief but poignant moment, Gall explains that this show is about saving music from fading into obscurity. She is a powerful advocate for the genre and clearly carries a deep knowledge and love of her subjects. It would be even more compelling, then, if the show also included live accompaniment in order to more fully immerse the audience in the experience of cabaret chanson. At present, Gall sings to prerecorded tracks. She speaks about owning an accordion—admitting in a funny anecdote that she bought it without having learned how it play—and it would add greatly to the show to have her play. All told, Gall performs this beautiful songbook with a bel canto vocal style and lovely tone. With interspersed moments of self-deprecating humor and genuine joy, the show is best understood as a celebration. Audiences should expect a cabaret concert that builds toward an audience-participatory rendition of “Non, Je Ne Regrette Rien.” With this in mind, like the Little Sparrow, Piaf and Brel: The Impossible Concert, will leave you with no regrets. Piaf and Brel (The Impossible Concert) is written and performed by Melanie Gall with Bennett Paster on piano. Costumes by Wendy Gall.